Bass Cabinets And Bass Amplifiers now and again I like to have a look at Bass Amps And Speakers ,After all where would we be without those monster speakers of our past, And the dynamite smaller packages out today. Features a Crate 8″ speaker, and 12+ watts RMS. BX15 includes four band EQ, limiter, and headphone jack. The perfect 1st bass amp, home practice or home studio amp. Tube tone, reliability and value. I’ve had it for a couple years and hardly ever used it. It works perfectly fine and sounds pretty decent for a little practice amp, I even played regular guitar through it a couple times because it’s so easy to carry around. And the guitar tone doesn’t affect the amp at all, it would be the other way around, if a bass guitar was played through a guitar amp, that would be bad. Mesa Walkabout Scout 15 combo in fantastic condition – $750. This amp still has 8 months of Mesa warranty coverage! This is considered by many to be Mesa’s best-sounding bass amp. This hybird tube preamp/solid-state power amp produces fat, rich vintage tones in a powerful (300 watts at 4 ohms) easily transportable package. The 4-ohm Scout cabinet has a 15″ woofer and adjustable (and defeatable) tweeter and it also has a downward-firing 12″ passive radiator speaker. Sounds fantastic, zero issues. Includes original Mesa cover and owner’s manual. This amp basically looks new with the exception of (pictured) torn tolex on the bottom back panel. Other than the tears on the bottom back panel, this amp looks brand new. Price is firm at $750. Sorry, no trades. Will ship it in the lower 48 for $825 total. Crate Bass head cool and rare! 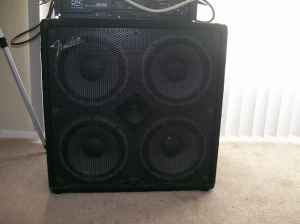 selling a cool bass amp its 285 watts at 2 ohms or 140 watts at 4 ohms, plenty loud ,and sounds great, it is an early SLM era bass amp, the company who later bought ampeg, so it is basically an ampeg head on the cheap, it was originally sold with 2 2×15 cabinets totally huge! anyway since its crate its not worth much but sounds way better than any of the solid state peaveys etc for the price range, i used it with my old gk800 rb and it sounded close. It works great as a second guitar head if you are into effects heavy pedal chains etc, pairs awesome with a tube head! Great old 1965 Ampeg b 18 n, recently serviced and cleaned in tip top studio ready quality. Cosmetically the amps in great shape, only major blem is the P of the emblem on front is missing, glass Ampeg emblem in great shape and lights up. This amp is the real deal–serial # 59924, manufactured in Scottsdale, Arizona. It comes rack-mounted in a wheeled road case with a Furman M-8 Merit Series power conditioner. It has both tube and solid-state preamps, and can generate an impressive range of sounds. I’ve used it exclusively for upright bass, so I have never ran it over even 50% of its potential power. The damn thing is LOUD–it’ll run you right out of the house! No problem getting over the loudest drummer I’ve ever played with. I have really enjoyed the 4X10 cab, with its punchy, clear sound and more bottom end than I’ve ever needed. The cab comes mounted on rubber wheel casters, which I consider a “must have”. This unit has never been toured with, and has seen only moderate and careful use around town. No drops, no rain, no beer spills, etc. Speakon and 1/4″ outputs, with a direct DI output in back of the amp with its own level knob. Sound guys love that one. The amp works and sounds great. It works just fine if you plug into the effects input. It has all of the original speakers and they have been reinforced with new speaker dope. I will split it up but not until the head is sold. I will also give preference to buyers who want the whole stack. It sounds excellent for guitar or bass. It’s a super versatile amp. I would totally be willing to trade for a Fender P Bass, Jazz Bass, Guild Bass, Kramer Aluminum Bass, Geddy Lee Jazz Bass or maybe a Sound City Head. Recently re-tubed, re-capped, and biased! I will sell these separately. Both cabinets are UPGRADED with Eminence Neo / Neodymium speakers. They are in EXCELLENT condition! The carpet covering is not frayed on either cab. They are each 8 ohm cabs. The Goliath III Son of Bertha is loaded with a single Eminence Kappa Lite 3015 15″ 450 watt 8 ohm Neo and Foster tweeter/horn which makes this cab very powerful and very lightweight. It has removable casters. It sounds great by itself. . The Goliath Jr. III is UPGRADED with 2 Eminence Deltalite II 2510 10″ 250 watt Neo’s. This cab also has the Foster tweeter/horn. This cab does not have casters. It also sounds great by itself or combined with the Son of Bertha 15. Together they have a very rich full sound and they are very portable and easy on the back. I have used them in different configurations depending on the venue/size of room or outdoor gigs. You will not be disappointed. Both cabs come with padded nylon slipcovers to protect the awesome condition these cabs are in. They are Fenders and are for bass guitars, but i used them for my guitar and they sound great! They are in perfect condition and they are good for jamming or for playing some shows! I Bought them both together because they play better together. The first one is a a Model BXR115B with the Power Rating of 150w Cont. & 300w Peak. The Second of is a Modle BXR410H with the Power Rating of 300w Cont. & 600w Peak. They are VERY good i dont use them anymore. So if your intrested, Please, Dont hesitate to ask! 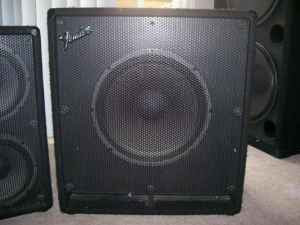 The Price For Both Speakers Is $250 but we can negociate a price!